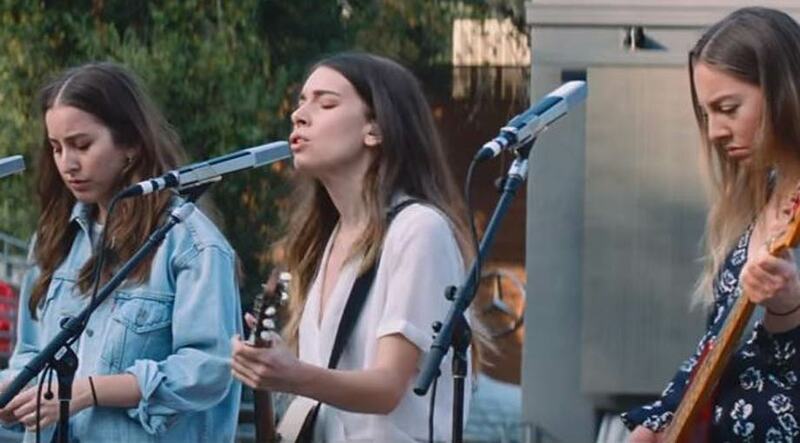 Haim enlist the help of Hollywood director Paul Thomas Anderson to shoot a live recording of their performance of the song ‘Night So Long’ at The Greek Theater in Los Angeles. The performance teams Danielle, Este and Alana Haim with synth player Tommy King and percussionist Jody Giachello. Having previously directed the sisters on their ‘Right Now’ and ‘Little of Your Love’ videos, Paul Thomas Anderson returns for this raw live performance which goes from the trio performing in the sunlight to an empty theatre, and segues to their real evening show in front of thousands of fans on October 19th 2017. The sisters dropped their second studio album ‘Something to Tell You’ in July 2017 via Polydor Records, following their stunning 2013 debut ‘Days Are Gone’. The sophomore offering peaked at number 7 in the US charts and number 2 in the UK. ‘Want You Back’ was the lead single, followed by ‘Little of Your Love’, ‘Walking Away’ and the latest single which was released this year, ‘Nothing’s Wrong’. The band worked with producers Ariel Rechtshaid, BloodPop, Rostam Batmanglij and George Lewis Jr. on the record. Haim will return to The Greek Theater on April 6th during their North American Spring tour. They’ll be supported by Lizzo on the forthcoming dates, which also includes two performances at New York’s Radio City Music Hall. They are set to appear at Coachella Festival in Indio, California on April 21st.